Heard this saying before? Or something similar? It’s a bit of a mantra for me, I reckon it applies to almost every aspect of life….be it work, staying fit, competing in an event, family life, travelling. So it makes sense that it should apply to healthy eating too. Preparation is the absolute key to good nutrition in my view. We’ve all spent those nights after work, wandering the supermarket, looking for inspiration for dinner. Either that or giving in and ordering takeaway. Often this will result in a meal that is fast and convenient rather than fresh and nutritious. It sounds so boring, but it is essential to do a bit of prep for the week to make sure you’re organised with healthy meals. 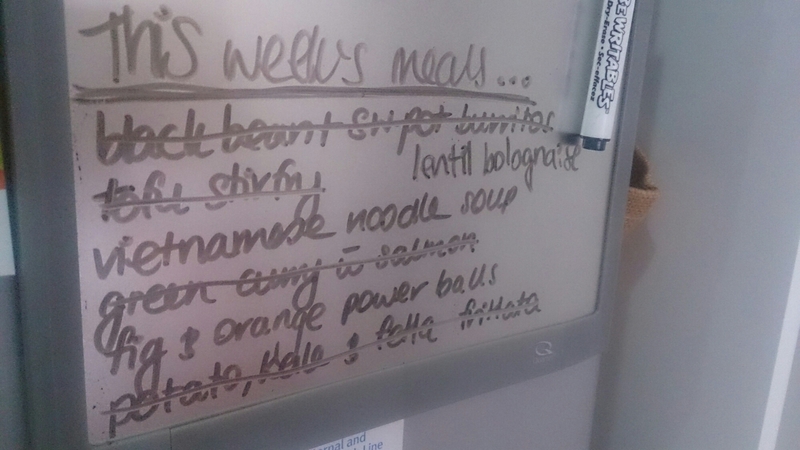 As in the picture above, I start by jotting down the “meals for the week” on our fridge. This gives me a basis from which to organise the shopping to make sure I have everything I need. Once the shopping is done, I’m confident that I can come home on any night, check out our little menu on the fridge, and know that I have the ingredients to make anything on there.